800 1000 1100i (Fireplace Insert) CB1200 (Classic Bay 1200 Freestanding) CB1200i (Classic Bay 1200 Fireplace Insert). 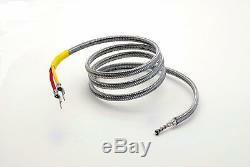 We do offer the Thermocouple for all Quadra-Fire models. Please message us or see our other listings. Designed Specifically for the above mentioned models. Guaranteed Quadra-Fire/HHT Factory OEM Replacement Part. The Thermocouple is the device that monitors the fire after start-up. Once it reaches temp the thermocouple allows the stove to start feeding on it's own in normal operation mode. If your stove goes out after the initial start-up cycle, more than likely the thermocouple needs to be replaced. Over 25 years of trusted value and commitment to our customers. The item "QuadraFire Thermocouple 800, 1000, 1100i, 1200, 1200i Pellet Stoves 812-0210" is in sale since Thursday, January 19, 2017. This item is in the category "Home & Garden\Home Improvement\Heating, Cooling & Air\Fireplaces & Stoves\Replacement Parts".